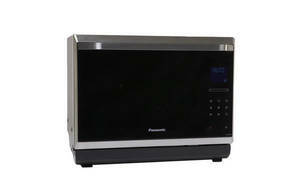 Snapshot: The Panasonic NN-CF874BQPQ is a built-in/benchtop combination microwave with 6 power levels and auto-cook. How well does it cook and grill? Good at microwave cooking and grilling. Very good at convection cooking. Excellent at melting chocolate on auto-melt setting. Digital display is bright and clear. Audio feedback when using controls. Audio feedback to prompt putting food in once the oven’s preheated on convection mode. Comes with glass shelf, enamel shelf and wire shelf. Self-cleaning catalytic plates on top and back wall. Flat bed (no turntable), so easier to clean. Drip tray at front of oven collects excess water during cooking and is easy to remove and clean. Very difficult to see through the door during cooking. Noticeable fan noise after cooking completed. No catchment area inside in case of spills.